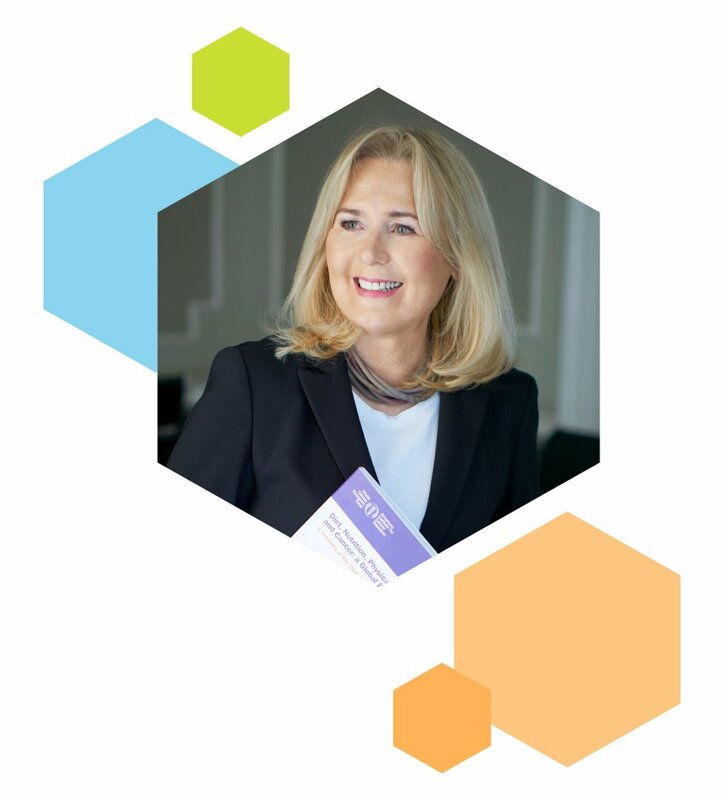 This year has been a momentous year as we prepare for the launch of our much-anticipated Diet and Cancer Report (Third Expert Report). This report will ensure that that everyone, from researchers to policymakers to the public, has access to the most up-to-date information on how to reduce the risk of developing cancer, as well as highlighting important areas for future research into cancer prevention and survival. Thanks to over 30 years of groundbreaking scientific research funded by World Cancer Research Fund, we know there are many things we can do to prevent cancer. Around 40% of cancer cases are preventable, and eating a healthy diet, being more active each day and maintaining a healthy weight are, after not smoking, the most important ways you can reduce your cancer risk. In the UK someone is diagnosed with cancer every two minutes. There are 2.5 million people with cancer in the UK, and with that number expected to rise to 4 million by 2030, there is still much more we need to do. We will continue to ensure that cancer prevention remains a priority. Our work will continue to help even more people have healthier, cancer-free futures. Our mission is to champion the latest and most authoritative scientific research from around the world on cancer prevention and survival through diet, weight and physical activity so that we can help people make informed lifestyle choices and reduce their cancer risk. FUND scientific research into the links between cancer and lifestyle, particularly diet, weight and physical activity. ANALYSE all the research in this area from around the world to ensure our message is current and based on the most accurate evidence. 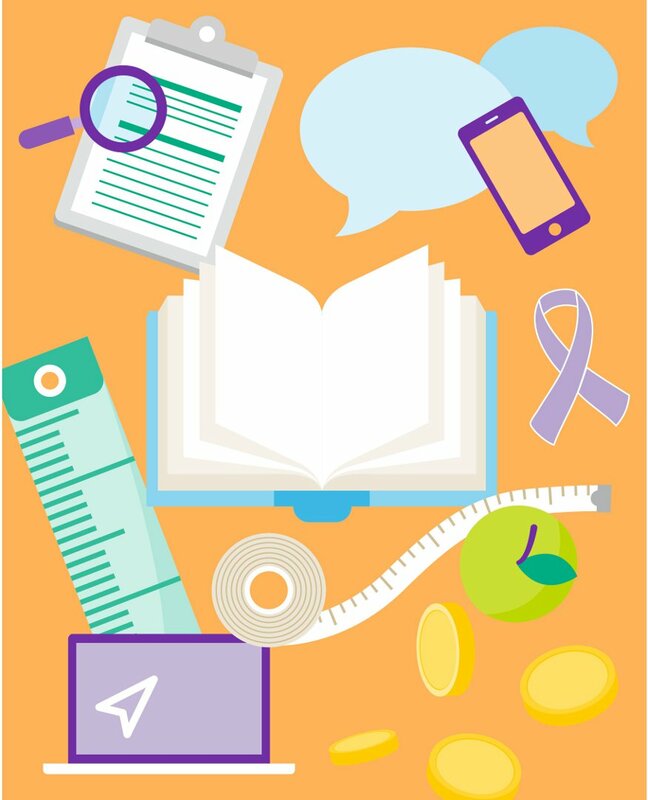 GIVE people practical, easy-to-understand advice about how to reduce their risk of cancer. WORK with governments and decision-makers to influence policy. The cornerstone of our research programme is our Continuous Update Project (CUP), which informs all our work. It is the world’s largest source of scientific research on cancer prevention and survival through diet, weight and physical activity. We collate all the evidence from across the world so we have a clear picture on what people can do to prevent cancer through diet, weight management and physical activity. We translate this scientific data into accurate, accessible Cancer Prevention Recommendations, to support people to make healthier lifestyle choices for a cancer-free future. Why is the CUP so important? CUP findings inform our Expert Reports, which give a comprehensive analysis of the worldwide body of evidence on cancer prevention. Analysis from the CUP helps us to produce regular reports on individual cancers. This year, we published reports on the links between diet, weight and physical activity and bladder, stomach and oesophageal cancers. Our 10 recommendations to help everyone reduce their cancer risk are based on the latest scientific evidence available from the CUP. The CUP helps us identify priority areas for research in the future. Other cancer charities focus on treatment. We’re different. We focus on prevention. Since inception, we have invested £104 million in research projects that contribute to filling gaps in our scientific knowledge about cancer. Our research looks at the links between diet, weight, exercise and cancer. Every year we invest in research across different areas of science, including both review projects, such as the Continuous Update Project, and traditional laboratory-based projects. Professor Richard Martin and his team at the University of Bristol found that some insulin-like growth factor proteins were associated with prostate cancer risk and its progression towards a more aggressive disease. Additionally, an earlier age at puberty appeared to have an effect on high-grade prostate cancer. The team at Bristol University, led by Dr Sarah Lewis, has shown that there is some evidence that milk causes prostate cancer by stimulating a type of growth hormone. This year we have funded three new research projects, including research at Imperial College London led by Dr Inga Prokopenko, who is investigating the shared genetic factors and mechanisms between Type 2 diabetes and an increased risk of developing colorectal, prostate or postmenopausal breast cancer. The research will help evaluate cancer risk in Type 2 diabetes patients and will help inform screening frequency, public health preventative strategies, treatment and the development of personalised medicine. Eating more wholegrains such as brown rice or wholemeal bread can reduce bowel cancer risk. The findings from both these reports further support our Cancer Prevention Recommendations. We work collaboratively with organisations across the world to ensure cancer and non-communicable diseases (NCDs) are seen as a top priority by policymakers worldwide. We work closely with the World Health Organization (WHO) as part of our Official Relations status, other inter-governmental agencies and national governments. We supported the WHO in their development and launch of the Decade of Action on Nutrition at the UN General Assembly. Our NOURISHING framework helps policymakers worldwide to identify where action is needed to promote healthy diets and reduce obesity. 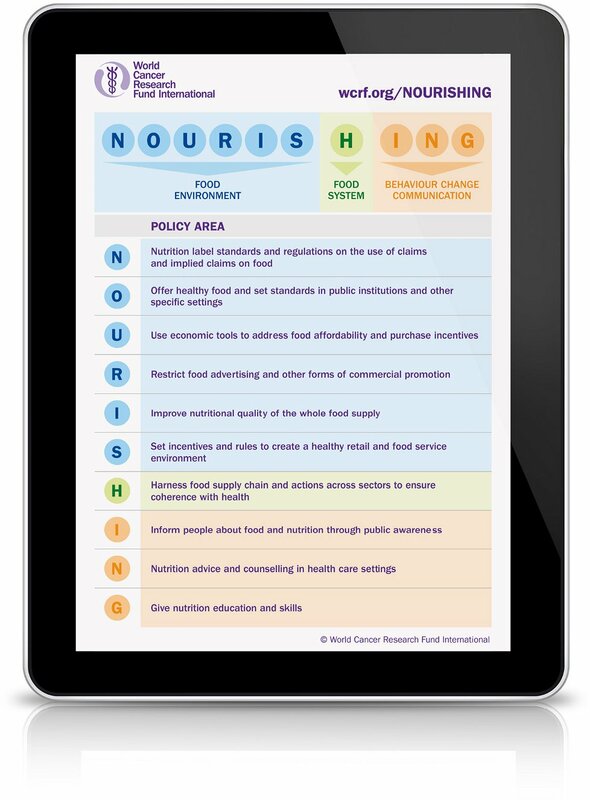 NOURISHING is now the leading global source of information on this issue, with over 450 implemented government policy actions and 90 evaluations across 129 countries. In 2017 we updated our policy brief, Ambitious SMART commitments to address NCDs, overweight and obesity, to support governments as they develop national food and nutrition plans and targets. This included identifying double-duty actions which have the potential to prevent both undernutrition and overweight and obesity. We redeveloped our website and have seen an increase in visits, lower bounce rates and the highest retention rates for the site since its redevelopment in 2014. The cancer prevention section is now one of our most popular sections. It now includes information on 30 cancer risk factors in addition to our Cancer Prevention Recommendations. Our recipe section RealRecipes has been redesigned, and we’ve created new content and recipes. We saw nearly 140,000 page visits between April and September, a 182% increase over the previous reporting period. Our Healthy You blog, which shares lifestyle tips, news and supporter stories, has been recognised as one of the UK’s top charity blogs and has helped increase our social media traffic and engagement. We have been awarded the ‘blue tick’ verification on our Twitter and Facebook accounts. This is a badge that lets people know that an account of public interest is authentic and they can trust the information. We have also set up an Instagram account and now have an active community of 668 followers. We started our programme to expand our health information for people living with and beyond cancer. Research showed there was a lack of healthy nutritional advice for cancer patients to help them cope with the side-effects of cancer treatments. 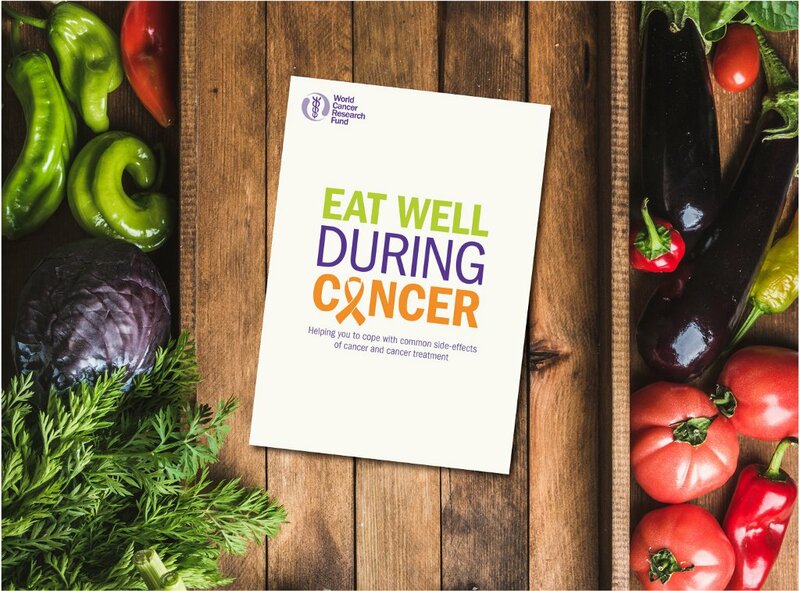 Our Eat Well During Cancer booklet, published in September 2017, addressed this gap. The booklet was written with the support and endorsement of the British Dietetic Association’s Oncology Specialists Group. In December we delivered a one-day conference in Liverpool – a location with poor health outcomes – which covered our Cancer Prevention Recommendations and skills to support behaviour change. We reached more of the public through our cancer prevention membership package for healthcare professionals, which amalgamates of all our publications, tools, training and newsletters into one Cancer Prevention Package. We have recruited 827 new health professionals to our scheme, bringing the total to 6,000 members. We collaborate with others who are keen to work with us on projects to disseminate our healthy lifestyle messages. We worked in partnership with Bowel Cancer UK to deliver a half-day pilot training workshop to specialist screening practitioners (SSPs) from North Staffordshire. The pilot aims to evaluate whether provision of training enables SSPs to deliver our cancer prevention messages and motivate people to change their behaviour. As members of the Obesity Health Alliance (OHA) and the Alcohol Health Alliance (AHA), World Cancer Research Fund has supported activity to influence government and public health policy particularly around childhood obesity, the sugar tax, junk food marketing, alcohol labelling and minimum unit pricing. We worked with the OHA on a story about children’s sugar consumption and with the AHA on calling for an increase in the duty on cheap cider, both of which gained considerable coverage and awareness. 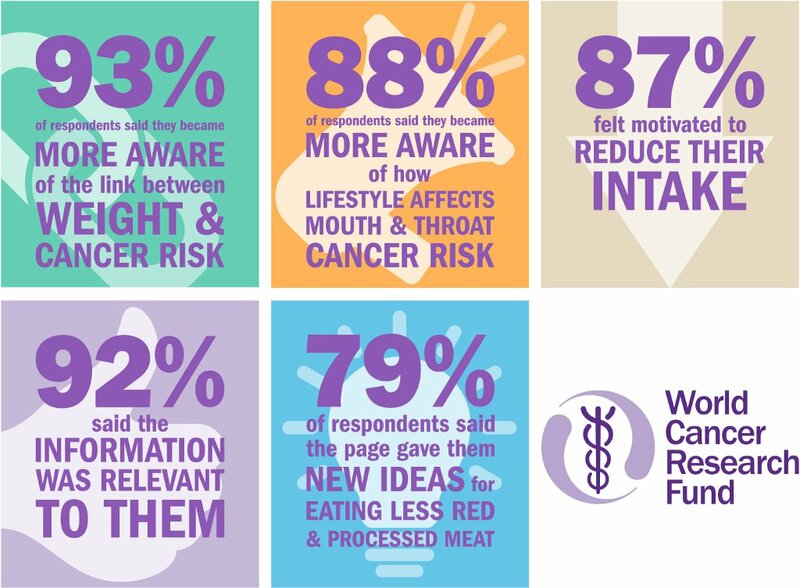 World Cancer Research Fund would not be able to continue our vital cancer prevention research and health information programmes without the commitment of our supporters. Stephen and Richard Everett took part in a skydive in memory of their uncle and father who they recently lost to cancer, raising vital funds for World Cancer Research Fund. 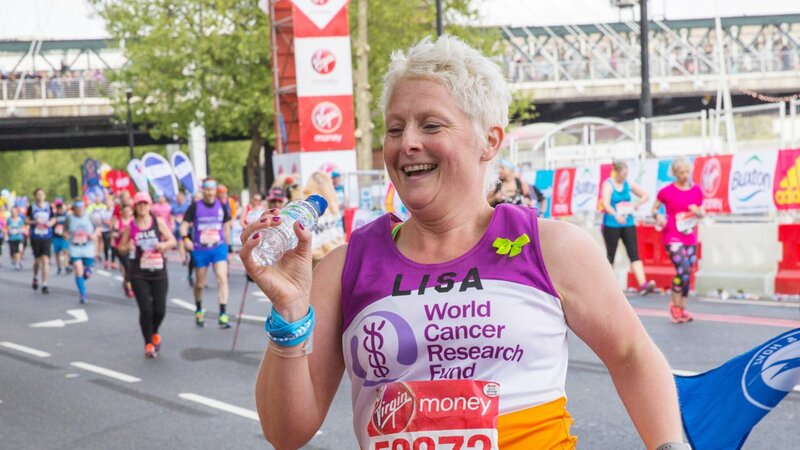 Lisa Blair ran the London Marathon on behalf of her dear friend Mike who was diagnosed with terminal cancer. Our events in Oxford and London gave our supporters the opportunity to find out more about our work. Trustee Prof Ashley Cooper, WCRF research grantholder Ruth Travis (Oxford University), and Teresa Norat (lead researcher on the CUP project at Imperial College London) were key speakers. We are also grateful to those trusts and foundations who have supported us and who wish to remain anonymous. The charts contain summary information for the statement of financial activities of World Cancer Research Fund for the year ended 30 September 2017, but are not the full statutory report and accounts. The full financial statements were approved by the Trustees on 23 April 2018 and subsequently submitted to the Charity Commission. World Cancer Research Fund received an unqualified audit report and copies may be obtained from the charity’s head office. Publish our Third Expert Report: Diet, Nutrition, Physical Activity and Cancer: a Global Perspective, which brings together the very latest global research into diet, nutrition, physical activity and cancer. Launch our updated Cancer Prevention Recommendations, based on the evidence provided by the Third Expert Report. Launch an online Cancer Health Check to help people check their own personal risk factors. Plan the future work of the Continuous Update Project, which may include adding new cancers to the 17 currently being investigated. Identifying the mechanisms that underpin the effects of diet, nutrition and physical activity on cancer. Addressing the host factors that influence an individual’s susceptibility to cancer development or progression.